An investigational immunotherapy drug being tested in the treatment of a rare form of skin cancer known as Merkel cell carcinoma has been found to be well tolerated with a clinical benefit seen in up to 42 percent of patients who failed prior treatment and were observed for at least six months. That’s according to research from a Rutgers Cancer Institute of New Jersey physician scientist and colleagues across the globe that is being presented at the American Society of Clinical Oncology Annual Meeting being held in Chicago this week. The study is believed to be the largest trial to date investigating the programmed death-1 receptor ligand (PD-L1) in this form of cancer. Immunotherapies harness the body’s natural defenders, T-cells, in fighting a disease like cancer. T-cells can be looked at as a car that crashes into cancer cells. PD-L1 is a brake on the car that prevents it from crashing. The immunotherapy drug avelumab examined in this study allows that brake to be released, allowing T-cells to do their job in attacking the disease – in this case, Merkel cell carcinoma. Merkel cell carcinoma is a sun exposure-related form of skin cancer that is more aggressive than melanoma affecting 1,500 people each year in the United States and according to the National Cancer Institute, the number of cases diagnosed each year is on the rise. The five-year survival rate for this disease is approximately 60 percent and is only 20 percent for those with disease that has spread to other parts of the body (metastatic). “Chemotherapy and radiation are not associated with long-term, overall survival, and this form of cancer is uniformly fatal, especially for those with metastatic disease. With that, there is clearly an unmet need for treatment options in this population,” says the study’s lead investigator Howard L. Kaufman, MD, FACS, associate director for clinical science and chief surgical officer at Rutgers Cancer Institute of New Jersey. Dr. Kaufman and colleagues examined patients with metastatic disease. The study enrolled 88 patients, whose metastatic Merkel cell carcinoma progressed after receiving first or second line chemotherapy. Participants received a 10 mg/kg dose of avelumab every two weeks. Participants were followed for a median of 10 months. Investigators found 32 percent of patients achieved a complete or partial response (eight complete, 20 partial) and another 10 percent (nine patients) achieved stable disease. The findings also showed tumor responses to be rapid, with 22 of 28 patients (78.6 percent) responding to avelumab within seven weeks of starting therapy. A durable response was shown with 23 of 28 patients (82.1 percent) still responding at the time of analysis. Treatment-related adverse events were low grade (Grade 1 or 2) and seen in 62 patients (70.5 percent). The most common was fatigue (23.9 percent). Grade 3 adverse events were seen in four patients (4.5 percent) and included two cases of a reduction in lymphocytes in the blood and three cases of laboratory abnormalities relating to increased liver enzymes, blood cholesterol and blood creatine kinase. There were no Grade Four adverse events or death related to treatment. “The typical patient with metastatic Merkel cell is a male in his mid-70s and often with co-morbid disease. A lot of patients in this population are unable to tolerate chemotherapy. Those who are may not see a response for up to three months, and side effects are likely. Our study shows the response to avelumab is not only durable for some patients but also rapid, which translates into a manageable quality of life for them,” says Kaufman. “Yes, it may be a minor inconvenience to undergo an infusion for the treatment, but we’re seeing patients leaving the clinic feeling well and heading out to normal activities like shopping or dinner – not something we often see after chemotherapy is administered. The safety profile is remarkable. Side effects are easily managed and consistent with anti-PD-L1 antibodies in other tumor types,” notes Kaufman. The team did report Grade 1 or 2 infusion reactions to avelumab in 17 percent of patients, but Kaufman notes that this was controlled, and in many cases could be prevented with pre-infusion medications. The trial was sponsored by Merck KGaA, Darmstadt, Germany and is part of an alliance between Merck KGaA and Pfizer, Inc.
Rutgers Cancer Institute of New Jersey (http://www.cinj.org) is the state’s only National Cancer Institute-designated Comprehensive Cancer Center. As part of Rutgers, The State University of New Jersey, the Cancer Institute of New Jersey is dedicated to improving the detection, treatment and care of patients with cancer, and to serving as an education resource for cancer prevention. 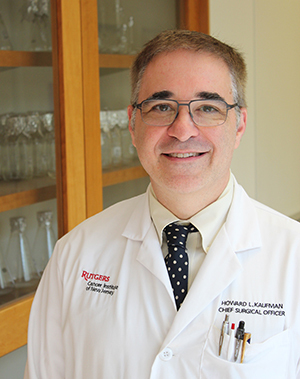 Physician-scientists at Rutgers Cancer Institute engage in translational research, transforming their laboratory discoveries into clinical practice. To make a tax-deductible gift to support the Cancer Institute of New Jersey, call 848-932-8013 or visit http://www.cinj.org/giving. Follow us on Facebook at http://www.facebook.com/TheCINJ.